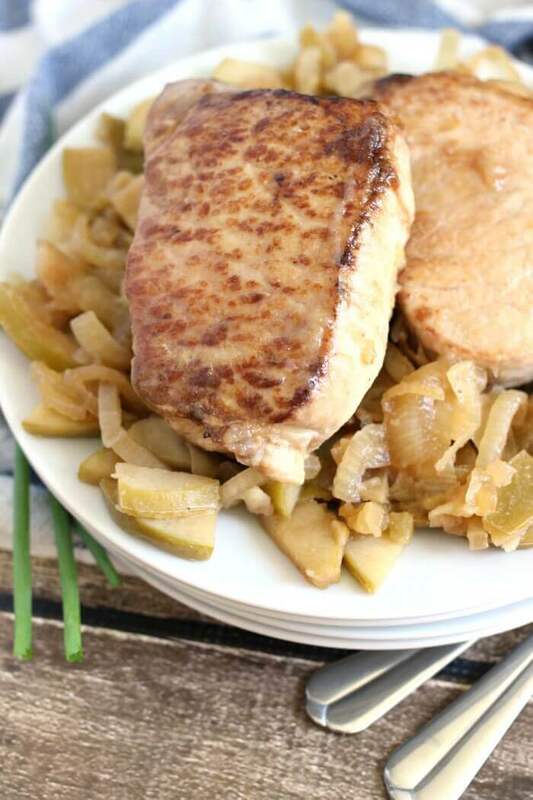 Baked Pork Chops are a simple and delicious dinner solution and great addition to this week’s recipe meal plan! 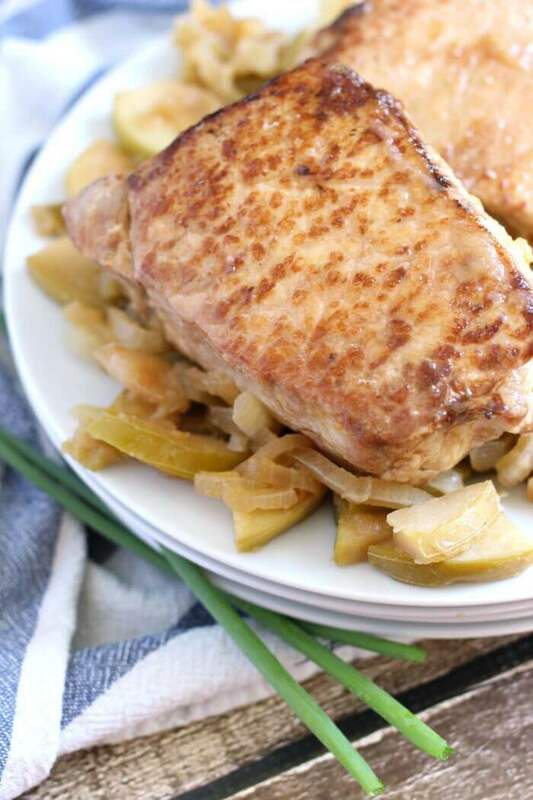 Our Baked Pork Chops were inspired by the pork chops with applesauce my mom made when we were kids. While generally never a fan of fruit and meat together, somehow apples and pork just work so well together! Serve it with mashed potatoes and roasted broccoli, and finish with some yummy orange cake! The first time I made them it was a last minute decision when friends were about to come over. Thankfully the dish turned out delicious and have become a staple dinner in our home. Sweet apples and onions, salty soy sauce and the caramelized meat. My mouth is absolutely watering right now! 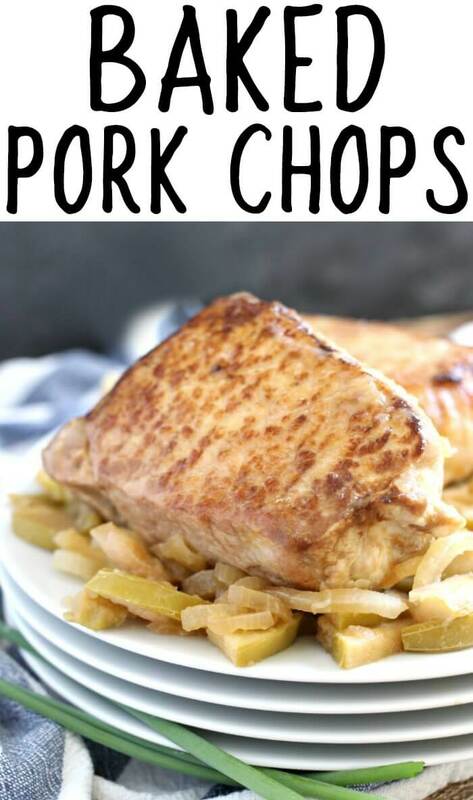 Pork chops – Thick cut pork chops are my favorite for this recipe. They come out delicious and juicy and yummmmm. If you have time to sear them, yay! If not, don’t even worry, it will still be awesome. Soy sauce – Soy sauce adds a saltiness but also a lot of flavor. We love the combination of soy sauce with pork. Onion – I like to use thinly cut sweet onions – yellow is good, vidalia is great. Red will work in a pinch. Apples – What is it about the combination of pork and apples? The sweet, and the salty, and the tender meat. It’s such a classic flavor! First, dip each pork chop in soy sauce (you can marinate them in the soy sauce for up to a day), make sure the chops are nice and wet. Then, sear pork chops on a hot skillet. This step isn’t absolutely necessary, but it does add a nice look to the dish and a little extra flavor. 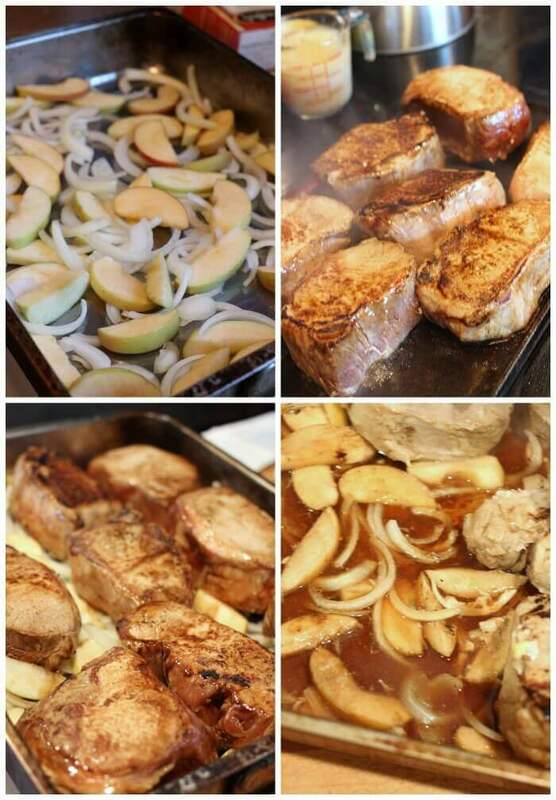 Next place apples and onions on the bottom of a roasting pan, and place pork chops over top. If you’d like, you can re-dip the chops first. Cover tightly with a lid or foil. Finally, bake until cooked through. It takes about 25 minutes at 425 degrees to cook thick cut pork chops. If you’re pressed for time, feel free to skip searing the pork chops. The flavors will still be delicious without the sear, but it may take an additional five or so minutes to cook through. Make sure to cover your pork chops with an oven safe lid or foil – this will help the pork chops cook faster and also stay moist because they will be cooking with steam. 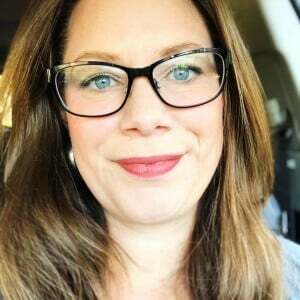 How do I make tender baked pork chops in the oven? The key to making tender pork chops in the oven, is to not overcook and to cover while baking. Covering the pork chops while baking will create steam in the dish and keep the pork chops moist and tender. 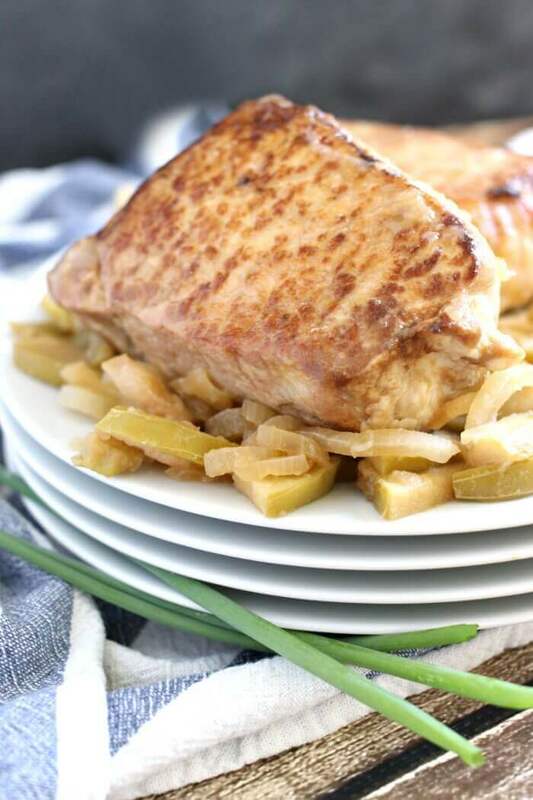 To make juicy pork chops, you need to have a lot of moisture – this is created with the soy sauce, the apples and the onions. 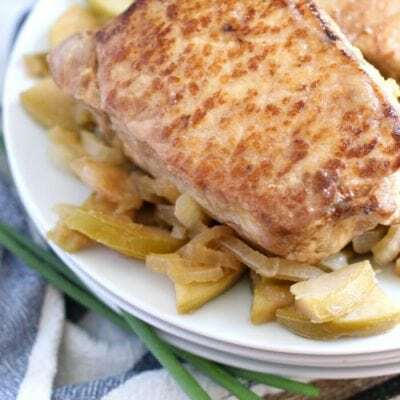 When you open the baked pork chops after cooking, you will notice the apples and onions have cooked down and a lot of liquid has been released. Baked pork chops are healthy. They are a great source of lean protein, and with the apples and onion we’ve added more minerals, nutrients, and fiber. Baked pork chops is a great recipe to make ahead and freeze. Freeze in a bag with all the juices and it will stay moist and perfect until you’re ready to have a quick easy dinner! For best results, reheat in the microwave. These oven baked pork chops are also a wonderful recipe to bring as a gift to friends in need – healthier than the traditional casserole, still simple to make, and super delicious. Baked Pork Chops are a simple and delicious dinner solution and great addition to this week's recipe meal plan! Pour soy sauce into a large bowl and dip each pork chop, wetting all sides. Optional: Quick sear pork chops on a hot skillet. 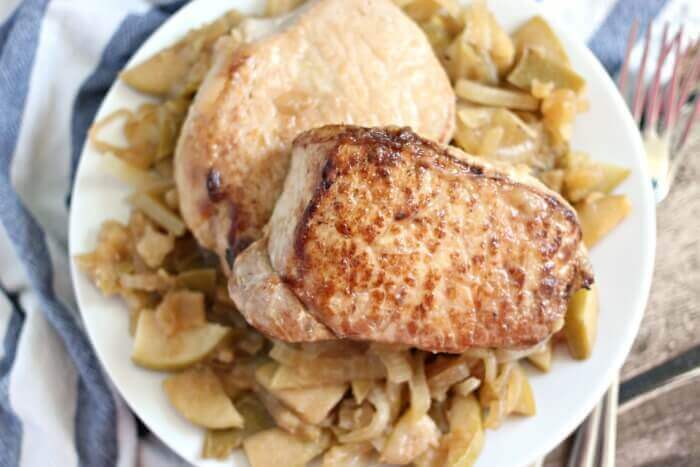 Place apples and onions in a roasting pan and place pork chops on top. Cover tightly with foil. Roast in a 425 degree oven for 25 - 35 minutes, or until chops are cooked through. Serve with apples, onions, and cooking juice over top. Enjoy! My husband is drooling over my shoulder. Now I have to go change my shirt. I tried this recipe today. It was easy and delicious! Thank you! What variety of apples do you recommend? I made these tonight. Easy and delicious! Thank you for a great recipe! You’re welcome! I’m so glad you loved our baked pork chops!